Another semester has begun here at West Chester University and with that, the Greek organizations on campus have been revived. Signs of sorority sisters seem to be everywhere — from women showing off their paraphernalia to the slew of Instagram posts. For those of us living on campus, it doesn’t take more than leaving your room to notice the Greek buzz wafting through campus. Two weeks ago, West Chester University held formal recruitment for this semester’s sorority hopefuls. Recruitment is an approximately one week-long process in which sorority chapters meet potential new members and see who would be a “good fit” to join their sisterhood. Going into the week, I had little to no idea what to expect. While there are some common trends between colleges, every university does their rush differently. Although, I am happily surprised to report that the process is generally straightforward and stress-free for the most part. 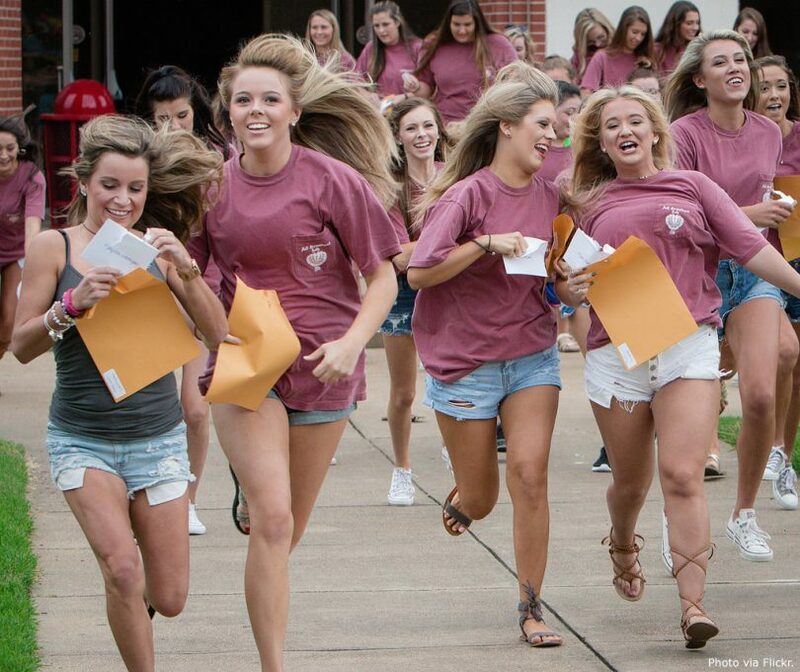 The first step in formal recruitment is being separated into groups of about 60 girls. Being that there were approximately 600 girls rushing and 10 sororities to visit, not everyone could visit a chapter all at the same time. On the first day of recruitment, the sororities had a designated room in which they would rotate through our rush groups. We had to meet every sorority, no exceptions. I really appreciated this concept because it kept people from being completely closed-minded about certain chapters. The first day was especially nerve-wracking, since we were meeting the sisters for the first time. Before entering the rooms, the women greeted us with a chant about their chapter and took us by the arm to chat. Everyone was enthusiastic and kind, with the only downside being that by the end of the day, I had repeated my name major and hometown about a hundred times. In total, there were four days of events with the chapter women and every day, they would decide if they wanted to see us again and vice versa. Each day, we met fewer and fewer chapters before narrowing it down to the singular organization we hoped to be a part of. This process was always difficult. On the first day, we only spoke to the chapter women for about 20 minutes, and conversations were done in groups. It was difficult to tell whether a chapter was the right fit. Most of us went off gut instinct, but even that was questionable. On day two, we returned to the chapters once again. Some women went to as few as two sororities, and some re-visited up to eight. This day, we were given the opportunity to learn more about the service projects each chapter did. Most showed a video explaining their philanthropy and hosted activities in their rooms such as coloring and other crafts. It was really refreshing to see these activities as it strongly opposed typical sorority stereotypes. The last two days of recruitment became extremely personal and emotional for many of us. We spent more time with the chapters, and it was difficult not to get emotionally invested. The final days included learning more about events the sorority sisters held and what their chapter meant to them. In one of the sororities, two women read letters to each other explaining the impact of their friendship; it was incredibly moving. I’m pretty sure everyone cried. The rush process was well thought out, personable and enlightening. Once again, I was thankful to see the support between the chapter women. Not only that, but it was refreshing to hear that all the chapters on campus support one another. No bitterness between organizations whatsoever! At this point in the process, it was surprisingly easy to decide which chapter would be a fitting forever home. From there, it was just praying that the feeling was mutual and getting an official invitation in! Overall, the rush process was well thought out, personable and enlightening. Be sure not to turn away from rushing a sorority solely because of how they’re portrayed in film and media. West Chester makes what would be a stressful process more tolerable with their organization and guidance. As for the sorority women and their new pledges, I am intrigued to see what they do next!